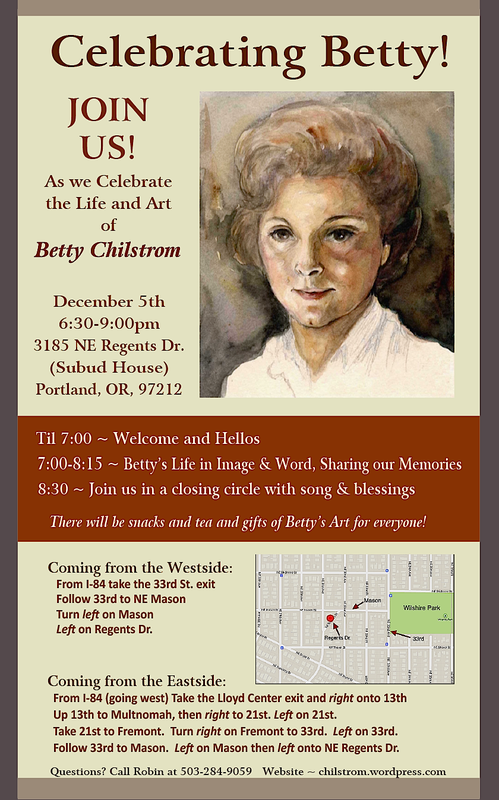 Betty Chilstrom, Artist | "House Painter of Portland"
Book Launch, Exhibit & More . . .
Join us on November 16th, 2018, for a Book Launch and Exhibit of over 60 oil paintings, many of which are in the newly published book: “Through Her Eyes,” a visual story of Betty’s life, featuring over 250 drawings and paintings. And, if you’d like to join in a Community Conversation about Portland neighborhoods and livability, please join us on December 9th and share your voice. This entry was posted in Betty's Art, Betty's Life, Uncategorized on 26 September 2018 by Robin Chilstrom. A book about Portland’s “Painter of Houses” has been funded for creation and publication by RACC (the Regional Arts and Culture Council), slated for publication in Fall, 2018. Click the link to find out more! Betty’s Chilstrom book in the works! This entry was posted in Uncategorized on 17 December 2016 by Robin Chilstrom. Please join us for the show’s opening at Cerimon House on Saturday, March 19th, 3-7pm. View Betty’s work, chat with friends and view a brief “Story of the Artist’s Life.” Cerimon House is located at 5131 NE 23rd Ave – smack dab in the middle of the Alberta Arts district. We’d love to see you there! If you can’t make it, the Gallery is open through summer 2016 by appointment. Just call Cerimon House at: 503-307-9599. Come to a show of Betty’s work! This entry was posted in Uncategorized on 11 March 2016 by Robin Chilstrom. Please join us for a special show of Betty’s work focusing on NE Portland neighborhoods and Historic Regional Sites. We are very pleased to partner with Cerimon House, a unique and wonderful NE Portland non-profit dedicated to the arts and humanities. The show will be up from early March through mid-April, 2016. We’ll keep you posted! This entry was posted in Uncategorized on 11 February 2016 by Robin Chilstrom. Join us in Celebrating Betty! Please join us on December 5th, 2014 as we celebrate Betty’s Life. There will be space for you to share thoughts and memories and mementos to take home! This entry was posted in Uncategorized on 31 October 2014 by Robin Chilstrom. This entry was posted in Betty's Life on 3 August 2014 by Robin Chilstrom.